This is an abridged version of the email interview that Sensei Malathi had with Iemoto Akane, on her return from the Sogetsu 80th Anniversary celebrations, in 2007. The complete interview and article was published in this blog earlier in Nov 07, as "An Interview with Iemoto Akane". Unfortunately, The Hindu chopped off the line, and I could not find the original picture! Sorry Prerana. The twain between the East and the West sometimes presents itself when you least expect it. Like in this ikebana arrangement by Prerana Mehta. Done with Arelia leaves and carnations, it explicitly brings out the contrast between eastern and western notions of floral design. Watch the line these Arelia stems take; upwards. The lines are important here. In Japanese, this is called the ‘Shin’ line or the line that drifts heavenwards. “In the West, you just clump a bunch of flower stalks in a vase to create a spectacular effect. In contrast, philosophical concepts are an integral part of ikebana”, Prerana says. This arrangement was a tribute to my teacher, she adds. 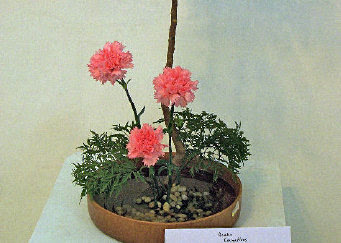 Incidentally, Ikebana is not primarily about aesthetics, and not even about just art. Its true significance lies in its philosophical reverberations. Which is perhaps why, the very process of putting together an ikebana arrangement calms down a person. In this particular arrangement, the limited use of material spells out minimalism. The shallow Moribana (a Japanese term referring to shallow containers that allow water to be seen) vase projects the water element. Prerana has trimmed the Arelia branch to make it look like a tree. To cover up the pin holders that she has used, Prerana has grouped more Arelia stems at the base level. “Not just Arelia stems, any kind of stalk (even flowered ones) may be used”, Prerana says. This arrangement will remain fresh at least for five days. Here are the photos of an eventful, fun and creative Ikebana workshop earlier this week, where the focus was on improvising or creating your own vase. While uploading them, blogspot seemed to take on a life of its own, and kept jumbling the picture order!! So, the writing and the pictures are not complementing one another, try as I might. Prerana - our hostess for the day - went the whole hog and transformed a dull and dreary steel water kettle into this ethnic vase! I loved the colour combination for the vase, as well as the lovely lines in the arrangement. Molly brought a little pull-along cart (is it her grandchild's?! ), and the violet lilies looked all set to be pulled off to the market! Trishala produced a cardboard box with a cut "window". Placing the vase inside that changed the entire shape of the vase don't you think? With the lovely long palm lines accentuated by the trimming of the leaves. Then she went to work on this bottle, which she tried to place at a graceful angle on the wrought iron stand, but try as she might, it would not stay! So finally, she placed the bottle upright and hung the stand on its neck!! Prerana and Meenu then had me looking further slack-jawed and mouth-open in astonishment, with their bottle creations. One had ribbon pakodas all around and the other created a nest that would put a bird to shame! For the curious, the "pakodas" (or should I call them murukkus?) are made with painted M-seal! Meenu's bird nest uses the packing straw she found at home, and of course she couldn't resist placing those birds there! Chiko school in her blood?! Venkatesh was very diligent with his vase-making. He brought three rather dull and shabby looking boxes, then asked Prerana for Fevicol, and suddenly we looked up to find three rather lustrous silver and gold boxes! These he used in combination with some teacups inside as water holders. Vaishali turned out a modern Sogetsu-looking vase, with all the characteristic colour and style with some gift-wrap paper, gathered in the middle to give it a "waist"! With the thermocol balls and twirly lines, it looked like a gift at a birthday party! As usual, I showed up with thermocol - thank you Apple for all the well-designed packaging that never lets me down! - and used a plastic bottle to hold the jerberas, in what I thought was a good way to bring out the lines and spaces in the "vase". Finally, rare bird Ashok also came by, carrying a Sathyam cinema popcorn pack. The popcorn served as the flower holder in his all-dry arrangement. Very nonchalant. Very Ashok! Most rewarding for me was watching the sensei beaming with satisfaction, and thoroughly enjoying all the creativity and fun! After all the "hard" work, there was plenty of Chaas and murukku and a great lunch, complete with icecream - lots of it! We missed Padma aunty, and wish her a speedy recovery so that she's back with us for the workshops to follow! I like this arragement. What do you think? Lets try to do so at our tomorrow's workshop! The flash of green is what catches the eye first. Your sight would then trail along the bright green Arelia leaves, perhaps perch for a moment on the brown-black twig in the background, and then hop on to the streak of flame-coloured and maroon orchids at the base. This floral arrangement by Trishala Vaishnav is a celebration of colour. The spectacle of bright hues is set off by the tiny white ceramic jar, as from a springboard. The pearly white aura of the jar is a perfect foil for the bright colours of the plant material in the arrangement. “The vase is small; so a single flower arrangement would not suit it”, says Trishala. A tiny arrangement, it can easily be accommodated on your work station, or even the window sill. The stalk of Arelia leaves trails out and upwards from the vase interestingly, as if to explore space. The orchids trail off in opposite directions, at a lower level. The casual trail of both the flower and leaf stalks is what makes the arrangement so interesting. The free flow of the leaf and flower trails effortlessly and creates a sense of serenity. You can opt for stalks of any kind of bright leaves, if they are small enough. As for the flowers, carnations in a combination of colours would look good too, she suggests. But orchids, with their brilliant hues, remain the first choice. The arrangement will stay fresh for at least a week. Engrossing exercise: Ikebana arrangement is a great way to destress. Getting your house ready for a formal occasion? Perhaps this is the kind of floral arrangement you can opt for. This tall and regal looking ikebana arrangement by Ikebana teacher Meenakshi Sarin exudes an impressive aura to the ambience. The tall silver vase lends the arrangement the height effect. To contrast with the gleam of silver, Meenakshi has placed a tarnished flat German silver vase atop it. As the German silver vase is wide and flat, pin holders will not serve the purpose here. So, Meenakshi has gone in for Oasis sponges into which she has stuck the stems to hold them in place. While the vivid roses arranged in various heights dominate the arrangement, the orchids accentuate the effect. A trail of delicate limoneum branches at the back of the arrangement provides a subtle backdrop. Green fern branches hang out from the vase to complement the feathery limoneum branches and give the arrangement a fuller look. The arrangement spans an impressive height of three feet. Kept in a cool place, and with regular trimming of the stalk and stem bases and if the water is changed regularly, the arrangement will stand fresh for a week. “Thanks to ikebana, I have been able to turn my focus on the tiny but engrossing facets of nature like leaves, twigs and flowers. It has been a great way to de-stress”, Meenakshi says. Well, didn’t someone say, God lies in detail? Hold a couple of branches in the vase by angling them against each other to form a cross, writes Hema Vijay Free style: Wayside tree branches can be put up at interesting angles in a vase. Fancy a freestyle artwork with plant material? In other words - freestyle ikebana. Just as abstract artists dream in colour and line without a predetermined composition in mind, Venkatesh Sthanusubramanian has worked casually with plant material to arrive at this interesting arrangement. “I had no specific theme in mind”, says Venkatesh. He started with a tall black container called Nagiere meaning ‘casually thrown in’ in ikebana terms. Venkatesh snapped off wayside tree branches which curved and zigzagged at interesting angles. He stuck a couple of the branches in the vase, holding it in place by angling them against each other to form a cross within the vase. Any tree branch would do, provided the branches are slender enough. “For instance, Copsia is a common plant with branches in lines and angles so beautiful that just keeping Copsia branches in a vase looks simply amazing”, Venkatesh says. To complement the branches, Venkatesh put in orange coloured Asia Lily stalks with both flowers and buds. The advantage with going in for a bud-and-flower combination is that you can snip off the flowers when they begin to droop, and in the meantime, the buds start opening up. This ensures that the freshness of the arrangement endures for a long time. You can substitute the Asia Lilies with vivid flowers like Gerberas or large Ixora bunches. The focus in this arrangement remains the tree branches. Wood represents aging and maturity in the realm of ikebana and so complements the black vase. Light or white coloured vases will not do here, as these tones resonate with youth, rather than maturity. Any tall, dark-coloured ceramic vase will set off the tree branch effect.